A fairly typical summer holiday meeting, with just a couple of games and a few visitors dropping in. 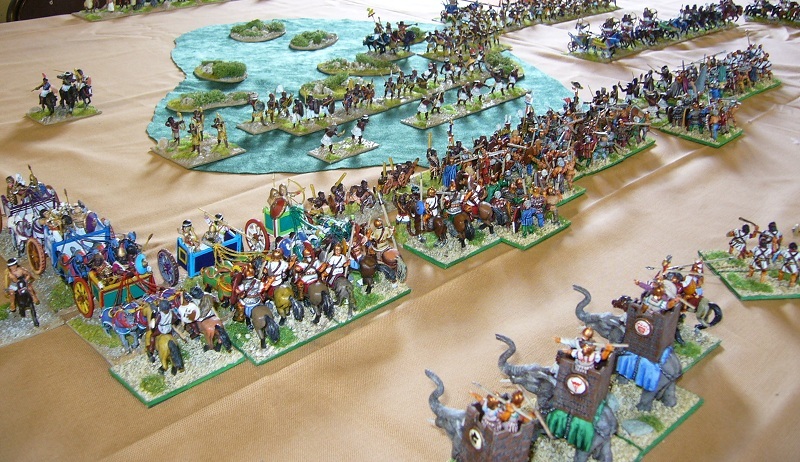 Michael and Sam played a 15mm FoG Ancients game, using Koreans and 12th Century Syrians. Sam won by a narrow margin - just one point! One unit of Syrian lancers did particularly well, single handedly taking care of one flank of the army, but things weren't going so well on the other flank, so it was a very close game. Kendall and Philip had a FoG Napoleonics game, using Prussians and Mamluks. Another close game, with Kendall getting the win. The Prussians were defending a couple of gentle hills with a strong force of infantry and artillery. Some areas of broken and difficult ground didn't affect the battle, other than slowing the Mamluk advance as they manouvred to avoid the bad going. Both armies had massed artillery in the centre of the table, and we both kept a respectful distance from each other, so most of the action took place in the flank sectors. The Prussian light cavalry division waited safely behind their infantry until the Mamluk cavalry had been spent on attacks on squares, and then counter-attacked most effectively. The Prussian musketry didn't roll well today, but the combat dice from their cavalry more than made up for that. It was a very enjoyable and action-packed game, with the losses of both armies gradually increasing to around the 40% mark. A final push by the Prussians pushed the Mamluks over the 50% level, including the capture of the command post. Well, that wraps up another year for the club. We have had rather more activity than in previous years, and looking forward to more club events and competitions next year. We have a Waterloo refight planned for January, and there's the Battlecry convention and World competitions coming up in February. The club's first meeting in January is on the 9th. See you all next year! Robbie and Ken had a Flames of War game, as practice for the Worlds next year. It was a see-saw game, and finished with Rob's British Paras beating the US force. We had two FoG-Napoleonics games. Kendall's Prussians beat Philip's 1815 Allied army using a well-placed flank march. Brett's French and Andrew's Italians (featuring lots of newly painted figures) had a drawn-out battle over some bad terrain, as you can see in the picture below. Another FoGN game at the club today between Kit using 1815 British, Dutch-Belgians and Brunswickers making their first appearance, against Brett's French army. A 40-20 win to Brett. We also had a couple of 25mm DBMM 240 point games to give us some practice before next week's tournament at AWC. Philip's Egyptians beat Rob's Portuguese, and Andrew's crusaders beat Kendall's Hussites. Some good exciting games with the 2nd ed rules. Andrew (Army of Italy) beat Brett (Jerome’s Westphalians) in a FoGN game using the latest version of the rules. The Italian cavalry division charged incessantly against the crowded Westphalian right causing them to become panicked and eventually break. Jerome’s doom was sealed by an Italian infantry brigade marching on a side road to capture his chamber pot. The new version has a tightening up of some rules allowing for quicker results. Additional uses for command points makes for tough decisions to be made for the players. In all a very good game. There were several North Shore players at Rallypoint. Mike Haycock was 1st with German Armour, and Ken Camel 3rd = with German Armour. Robbie was 6th= with British Infantry. Not a bad showing out of 32 for the first Tourney with the new Blitzkreig book. There were also some War Machine and 15mm Napoleonics (First Volley?) being played. Not much on at the club today. Kit (Polish Cavalry company) thwarted the Blitzkrieg of Ken (German Light Panzer company) by holding the line 4-3. First use of the new Blitzkrieg book saw an exciting see-saw game. There was a good turnout at the Battlefront GT with Ken, Kit, Lee, Lyndon, and Robbie representing our club. Kit was third overall, using a German Grenadierkompanie. The Battlefront GT is coming up soon, so we had a couple of practice games. Lee's Germans beat Brett's Finns, and Kendall got a win over Kit's Germans. Benny and Philip had a 25mm DBMM game using the new version 2 rules. Benny won 22-3, using Later Carthaginians against Kushite Egyptians. Congratulations to Grant Brown for winning this year's Push of Pike. We had ten players this year with a good variety of armies. Grant led his hordes of Aztecs to a series of great victories! 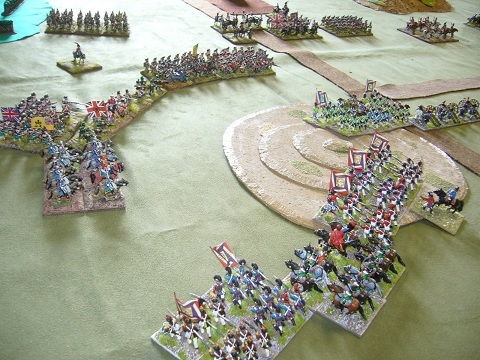 At the regular club meeting on the Sunday, there was also a Flames of War game. This weekend The City Guard hosted GuardCon with the Fields of Blood Warhammer competiton and a Lord of the Rings Grand Tournament. Robbie was there representing the club. Brett and Philip had a game of DBR in 15mm. Lots of losses on both sides, but Brett's C-in-C got into the baggage and won the game 8-2 to the Muslim Indians over the Algerians. The Push of Pike tournament is on the weekend of 25/26 September, so this was a good practice game for that. There were a couple of Flames of War games. Rob's British armoured cars got a 4-3 win over Ken's 3rd US Infantry. Kendall (US 2nd Armored Tank company) beat Kit (SS Panzergrenadier company) 6-1. The US tanks sprinted forward to assault the German PaK 43 battery while avoiding the menacing Tiger by firing smoke at it. Von Goldsbury was last seen trying to rally a platoon of Panzergrenadiers, leaving the single Tiger trying to defend two objectives at the same time. The DBA gathering was quite a success, with six players and twelve games played. Participants were: Benny (Carthaginians), Joel (Marian Romans), John (Swiss), Kendall (Mycenaean Greeks), Mark (Komnenan Byzantine), and Philip (New Kingdom Egyptians). Part of the motivation for running the DBA games was practice for the IWF next year, but DBA could be good for our club for casual games and for beginners getting into Ancients. Also at the club today, a Flames of War game between Michael (Russians) and Kit (Germans). The Russian heavy tanks were doing well against the Germans, until one of their lightly defended objectives was over-run by Pz IVs. Lots of games at the club today. There were three Flames of War games: Ken's Americans took on Kit's Germans. Lyndon's US Airborne took on a German force. Kendall used a German army with two king Tigers to get a 4-3 win over Michael who was using a Russian army. Philip and John played four quick DBA games, with New Kingdom Egyptians and Sea Peoples, and Philistines and Saitic Egyptians playing two games each, all the wins going to John! Rob (Empire) and Dan (Skaven) played a game with the new Warhammer book. Andrew (Italians) and Brett (Austrian Reserve Corps) had a game of FoG Napoleonics. The most spectacular game of the day was a 1/300 moderns game between Al and Bruce. 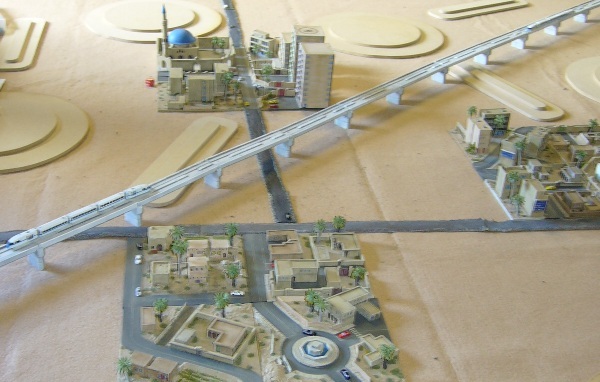 Much of the terrain depicting Kuwait had been produced by Kieran. DBR 15mm Grant (Aztecs 1500 AD) v John (Dutch Rebellion 1588 AD). Was going very well for the Dutch (who were outnumbered c. 3 to 1) until the bullets ran out. And then it didn’t. In the clash of cultures: Cheese and beer nil; chocolate and ripping people’s living hearts from their bodies 10. FoG-Napoleonics Brett (Austrians) beat Kendall (Prussians). Although the Austrians were defending (deployment dice differed by 3), they took the advice of their rash military advisor Andrew, and went on the attack, gaining the win. FoG-Napoleonics Kit (British 1815) beat Philip (French Army of the Orient 1801). Another attack-defence game. A 40/20 win to Kit. The picture below shows the British beginning to outflank the French who were defending a low hill. Andrew and Lyndon had a Flames of War game, with Brits and Germans fighting it out in an Italian scenario. It was a night attack on a vineyard. We had a couple more FoG Napoleonics game. Brett's new Westphalians got a decisive victory over Philip's Netherlands and British army. The Westphalian advance pushed the allied army back from their defensive positions, and then the reserve Netherlands cavalry arrived just in time to see their infantry leaving in rout. In the other game, Andrew's 1815 Neapolitans defeated Kit's British. A long skirmish line of Neapolitan infantry and wide ranging cavalry managed to pick off British units which became isolated. The British Dragoon Guards made a splendid charge on an opposing cavalry unit, routing them on contact, but that didn't save the battle for them. There was quite a lot of drooling over the new Warhammer book. The size! The colour! The price! Brett and Kit had a FoG Napoleonics game, with the French Old Guard defending against a British assault. There was lots of action, and both armies were in bad condition by the end of the game. Although resulting in a draw, it was an exciting game. We played the two remaining games in the Ancients competition. If either Rob or Sam won their game they would have won the competition, but as it happened they got a loss and a draw. That left three players with two wins, one draw and one loss each. Mike wins the competition as he had the highest score from all the games. Congrats, and good to see a win for a chariot army!